Marriott International was recently honored with the Corporate Achievement award by the Montgomery County Chamber of Commerce (MCCC) at their 2018 Business Awards Dinner, an annual event that celebrates leaders and organizations that strengthen the Montgomery County, Maryland, business community. The Corporate Achievement award – an award that Marriott also received from MCCC in 2000 – is presented to an individual or company that demonstrates leadership, innovation, commitment, and good corporate citizenship in the metro-Maryland area and beyond. MCCC recognized Marriott for its significant and lasting contribution to the local economy and to the community as well as the company’s consistent high standards for financial performance, sound management, and sustained growth over many years. 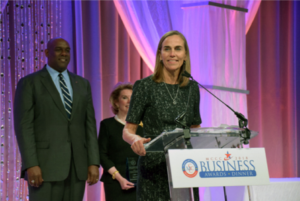 Leeny Oberg, Marriott International’s executive vice president and chief financial officer, accepted the award on behalf of Marriott. “It means so much to us that our fellow Montgomery County Chamber members would honor us for our work in this community. This area has been an outstanding home for our business. We have always found top-notch talent here, who enjoy a wonderful quality of life with communities and schools we can take pride in, diverse neighbors, and a dynamic regional economy. This community has provided the engine that has, in part, enabled our company’s growth,” said Oberg. Marriott has been part of the Montgomery County business community for more than 60 years and looks forward to continuing its support of the community as it moves its headquarters to downtown Bethesda, Maryland, in 2022. In addition to awarding Marriott International the Corporate Achievement award, in 2012, MCCC also awarded Mr. Marriott the Emeritus Business Leader of the Year award. He was recognized for his extraordinary leadership, his substantial impact on the way business is conducted in Montgomery County, and, for his true commitment to the community through many years of active and continuing service.